I remember thinking when Voyager 2 flew past Neptune in 1989 that it would be a test case for how long a spacecraft would last. The subject was on my mind because I had been thinking about interstellar probes, and the problem of keeping electronics alive for a century or more even if we did surmount the propulsion problem. The Voyagers weren’t built to test such things, of course, but it’s been fascinating to watch as they just keep racking up the kilometers. As of this morning, Voyager 1 is 17,422,420,736 kilometers from the Earth (16 hours, 8 minutes light time). 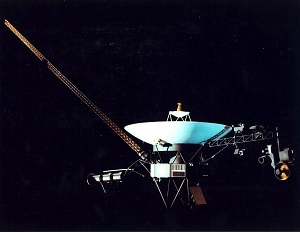 Krimigis is one of two principal investigators still on the Voyager mission, out of an original eleven, and the only remaining original member of the Voyager instrument team. These days he’s caught up with Cassini work (he’s principal investigator on an APL instrument aboard), but he did find time to report Voyager 1’s findings on the solar wind at the American Geophysical Union meeting in San Francisco. These are major observations, the first time since the beginning of space exploration that we’ve come to a place where the solar wind stops. But tempering that sense of excitement is the fact that we currently have only one mission following up the Voyagers’ path to the outer system, the New Horizons probe to Pluto/Charon and the Kuiper Belt. The Sun’s article quotes Norman Ness (University of Delaware) as saying that Voyager was the pinnacle of his career. “There is never going to be a mission in anybody’s lifetime, now living, that is ever going to get these observations in hand. So it’s once in a lifetime.” Stephen Pyne makes much the same point in Voyager: Seeking Newer Worlds in the Third Great Age of Discovery (Viking, 2010), leaving us with a reminder that continued expansion into deep space is by no means a given. …Voyager needed to keep its antenna pointed at the Earth at all times, so the spacecraft itself couldn’t turn. That meant Krimigis’ instrument needed an electric motor and a swivel mechanism that could swing back and forth for more than a decade without seizing up in the cold vacuum of space. “They said I was crazy,” Krimigis said. To spacecraft designers, moving parts spell trouble. Krimigis argued there was less mission risk in moving one component, than in turning the whole spacecraft. The solution was offered by a California company called Schaeffer Magnetics. Krimigis’ team tested the contractor’s four-pound motor, ball bearings and dry lubricant. “We ran it through about a half a million steps [movements], enough to take us to Saturn and then some. And it didn’t fail,” Krimigis recalled. With the spacecraft now expected to keep transmitting for twenty or so more years, we’ll surely see both Voyagers reach into true interstellar space before their power runs out. Then the loss of energy will take its toll. Somewhere around 2015 Voyager 1 will shut down its data tape recorder, just as Voyager 2 shuts down its gyros. As instruments go quiet, all power will be shunted to interstellar wind measurements and communications with the distant Earth. As we reach 2020, the few instruments still able to operate by sharing power will be unable to be supported. We’ll be left with nothing more than a tracking signal that can last perhaps as late as 2025. It’s hard to think of these splendid machines shutting down, but ponder that if they make 2025, that will mark almost fifty years of continuous operation for some of their components. The thinking here is that if a vehicle can survive such a lengthy journey without being specifically designed to do so, an interstellar probe built from the ground up to last a century or more should be well within our capabilities. No, it’s not systems reliability that’s the Achilles’ heel of interstellar flight. As always, it’s propulsion, and that other great imponderable: The will to explore. Norm Haynes, who was project manager for the Voyager 2 Neptune encounter, said of the event, “It wasn’t a once in a lifetime experience. It was a one-time experience.” Is he right? Is Pyne right that the Voyagers marked not the beginning but the end of a great era of exploration? These are troubling thoughts to those of us who believe that expanding into the Solar System and beyond is crucial not only for the good of the human spirit but for the very survival of our species. But long-term projects are guided by the decisions and the will of those who conceive and nurture them. The question now is whether we have the will to keep pushing, Voyager style, into the dark.